Available for all those Darts/Wind Surfing/Bowling movie needs! We remember that you saying that you exaggerated (read: lied) about your ability to swim when auditioning for HP: GOF. 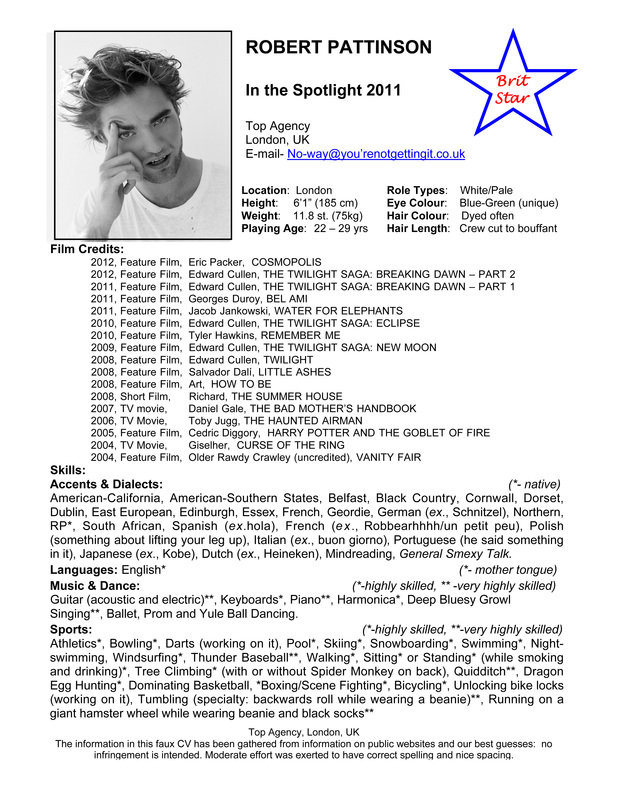 However, we believe you humbly left many things out of this resume and it absolutely needs to be updated and expanded. For example, why isn’t kissing listed as a skill? You were included in this list this has to be included!!!! And you didn’t include more evidence of your dancing skills! So many skills of yours are unique to you and should be highlighted, you never know how these skills could influence a casting for you! Don’t get lazy and assume people think they know everything about you now, because they don’t. You’re an enigma. Show them you’re more than Edward, show them you’re as versatile as Brando, or Nicholson, or better said, show them the versatility that is Robert Pattinson! Please see the Special Skills Portfolio for excellent examples of selected skills! These are only suggestions, but please do not be quite so humble! We want to to get the prime movie roles that will continue to showcase your talents! SEEEEEE Rob, they even made a special skills section much better than what I had in mind… but really I want to talk about the “highly skilled Sports” section in which you list WIND SURFING! DARTS and BOWLING! Really?! Can you be highly skilled at bar games and games you play at kids birthday parties? 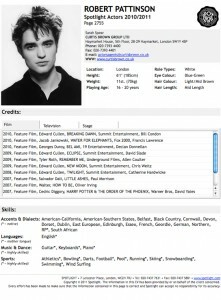 What else would you add to Rob’s resume? That’s right. I thought about myself. I thought about how my Linked-In profile (and resume) includes info on my “hobby” of the past almost-two years. It might seem silly, but all this blogging & social networking has actually made me better at my actual profession (in marketing). So I feel it does deserve a spot. Of course it’s all cleverly hidden under the guise of something professional. I write letters to Rob Pattinson on a semi-daily basis with a focus on the hottest pictures, funniest content, jabs at his girlfriend and run a reader forum where there’s a place to perv over hot pictures & fight with those who disagree with you over his relationship status. I create & maintain all content with a focus on timely, applicable posts and populate a reader forum with additional information and relevant topics. Go getter, self-starter who comes up with a vision and goes after it, no matter what the obstacles. The client I have worked with as a Freelance blogger at Letters to Rob.com doesn’t know I exist. Furthermore he’s afraid of people like me, yet that hasn’t stopped me from creating a place where his fans can be completely involved in his personal business & personal space. I have the acute ability to persist through duress, like when being called a fat, ugly, crazy cat lady. I push through the hard times when competitors try to tear down my numbers and cause me to fail. In fact, I have proven results that the struggles have increased readership and participation tenfold. Do you need some pictures of Rob with mildly suggestive text written over them? Then UC is your girl. Is your company lacking someone who will spend 3/4 of their time on Rob and Twilight sites instead of doing work for your construction/sales/marketing/ad/medical company? Don’t look any further than UC. She’ll drop whatever she’s working on the moment news breaks. She’ll gladly travel for work- preferring travel to London, LA & New Orleans this Fall. And no matter what, the client will always be satisfied. Or he will at least when he finds out she exists. 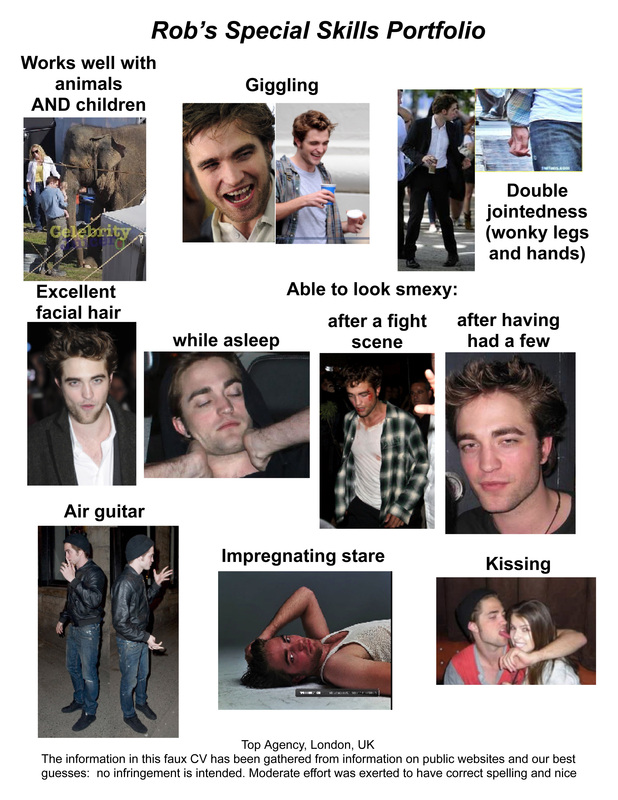 I truly am a Rob Pattinson Professional! UC- err that’s Doctor Unintended Choice to you! What do you think? Does my Resume/Linked-In profile look right? Am I missing any important “tasks” or special abilities?